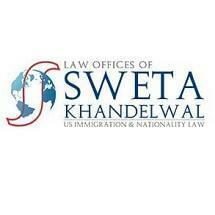 The Law Offices of Sweta Khandelwal is a U.S. immigration and nationality law firm based in the San Francisco Bay Area with offices in San Jose and San Francisco. We serve individuals, families, business in California, across United States and overseas. If you wish to work in the United States, hire a foreign worker, invest in the US, or reunite with your family in the US, we will partner with you to ensure the success of your immigration objective. The cornerstone of our legal practice is the promise of providing customized, creative and complete solutions that work for every client and their unique situation. We have successfully represented companies, their founders and employees across diverse industries. We have assisted families and individuals across more than 50 nationalities. The Law Offices of Sweta Khandelwal has been recognized as amongst the “Best Immigration Law Firms’ by SiliconIndia Magazine. Principal Attorney Sweta Khandelwal is an immigrant herself. She first came to the United States as a dependent on an H-4 visa, transferred to a student (F-1) visa, interned under the Optional Practical Training (OPT) program, worked on an H-1B visa and ultimately became self-employed while obtaining her permanent residency. She has even contested erroneous findings made by Immigration that almost led to the denial of her own Green Card! Thus, Sweta navigated her way through the complex web of U.S. immigration laws which makes her sensitive to the many challenges faced by her clients. Today she owns and operates her law firm with a deep sense of purpose- not only to provide the right immigration solution for each client, but to empathize with their individual immigration journey and unique story.